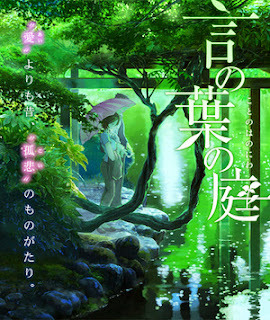 The Garden of Words is a sad film full of sad characters whose sadness has left them immobilized and isolated from others. 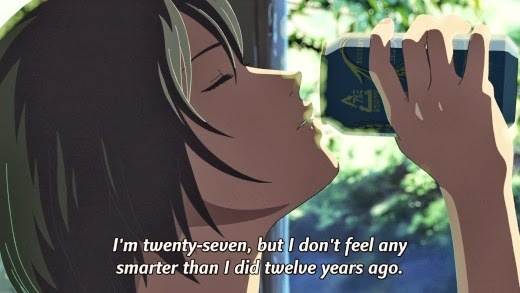 The main character, Akizuki, is a 15-year old boy whose life is in shambles--his parents are divorcing, his older brother (the sole stable figure in his life) is moving out of their apartment to live with a new girlfriend, and he will soon be on his own. 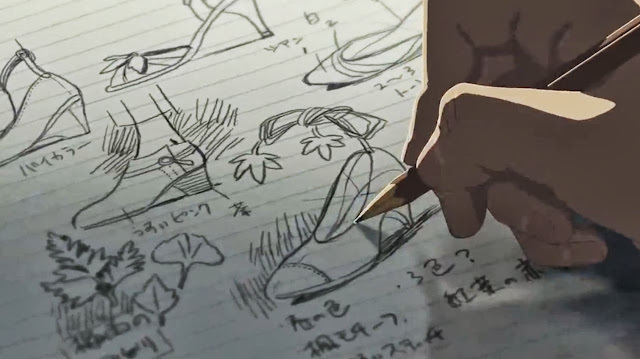 His dream is to design and make shoes, but as a student living alone he is struggling to make ends meet with a part time job, and is unsure of his future...the tuition and materials for the vocational school he wants to attend are beyond his means. The only respite from the constant worry he seems to feel are the walks in the park he takes on mornings when it's raining. Right away what I notice about this film is the slowness of its pacing, and the beautiful animation. The story moves slow, and the juxtaposed scenery between the hustle and bustle of city live and the oasis of the city gardens seems to be a character in its own rights. The animation is remarkable, from the strange angles and perspective it uses to tell the story, to the fantastically minute details the animators choose to focus on. 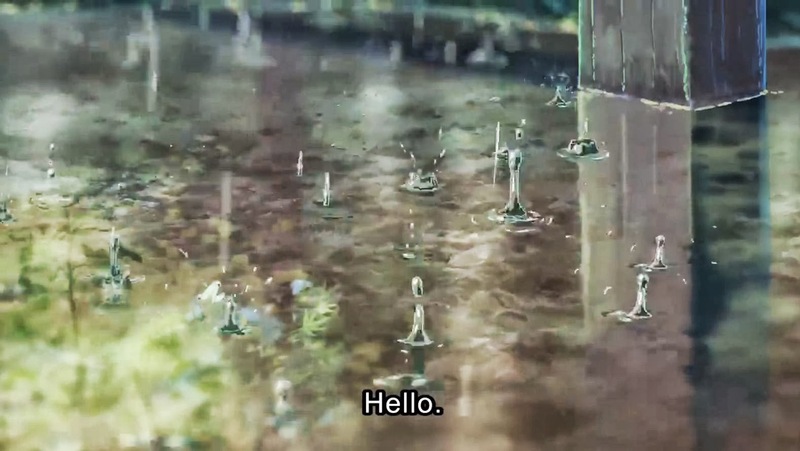 Thankfully, since this is a story whose plot begins to depend on rain, the illustrations of water and rainfall are stunningly gorgeous. Hello indeed! This screen capture is beautiful, but it doesn't do credit to the water in motion in this film. 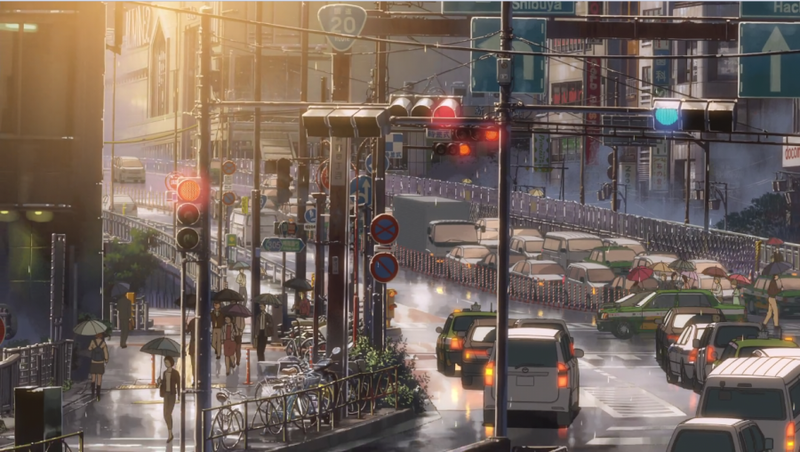 Scenes inside of Akizuki's cramped apartment as he works by lamplight are equally gorgeous, and show his dedication to his goals. This is a very Japanese film in terms of its philosophy of work and dedication, and stoicism in the face of increasing goals. Akizuki is a very straightforward, practical, character, but his dedication to his pursuits leave him little time for much else. He speaks infrequently and considers his words. He is often seen stealing moments to draw and design. The only bit of time he does seem to take for himself are on those rainy mornings. As the film starts we are made aware of Akizuki's habits and love of the rain. 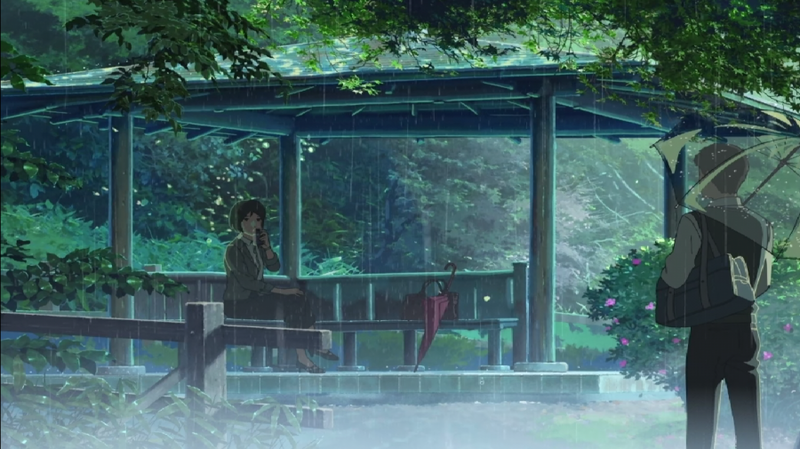 We see him wandering through an otherwise empty garden under his umbrella...skipping his classes until it lets up. On his wanderings he runs into a young woman sitting beneath a shelter. The share the space in silence as the rain pours...together, yet isolated. As she leaves she recites a classical tanka "A faint clap of thunder/clouded skies/perhaps rain comes/If so, will you stay here with me?" These are the only words exchanged and they part ways. Silence is an overwhelming theme in this film. Both characters are introspective and speak infrequently. In fact, as their rainy-day habits becomes a routine during the rainy season (both meeting in the morning at the same gazebo) they never even exchange names. Amid the silence their actions and hesitation becomes important, and slowly each learns more about the other's life...including their strengths and weaknesses. Each feels the keenness of loneliness, isolated from others by desire and circumstance--each is hiding in the shadow of the rain and shaded shelter from their worries. In their day-to-day lives each of them is frozen in a way...unable to move forward because they fear failure, or that their obstacles are too big to overcome. The woman (Yukini...we know her name before Akizuki does) seems especially broken, although by what we do not know until the end. During a stretch of sunny days their routine is broken and they drift apart feeling the pain of their separation. Although this is not, necessarily, a romance, there is something very sweet and tragic about the way these two characters are drawn to each other when they keep everyone else at arm's length. While they are apart he works and in his spare time begins to construct a pair of shoes to help her want to move ahead in her life. She stagnates. Both reflect on their futures and ambitions. Both fear failure. Just wait another 10 years, I don't feel any smarter than when I was 9. When the school year begins again he runs into her in the school hallway--apparently she left school after unbiased rumors of a teacher-student affair were created by a few bad apples. She was sitting in the gazebo every day trying to find the courage to return to her place in the literature classroom. He had heard nothing of the rumors, but confronted the students who accused her to defend her honor. Later he finds her crying at the gazebo, and she is shocked at what he's done. Thunder peals in the distance and he gives the answering Tanka to the one she recited when they first met: "A faint clap of thunder/even if rain comes not/ I'll stay here/ together with you." Together they seem to find a happiness with one another, borne of the encouragement each provides. But each knows that the feelings of love and respect they have for one another are impossible. In order to move forward as individuals they must leave behind the one person who seems to give them strength. Although that person will forever be a silent motivation to them. 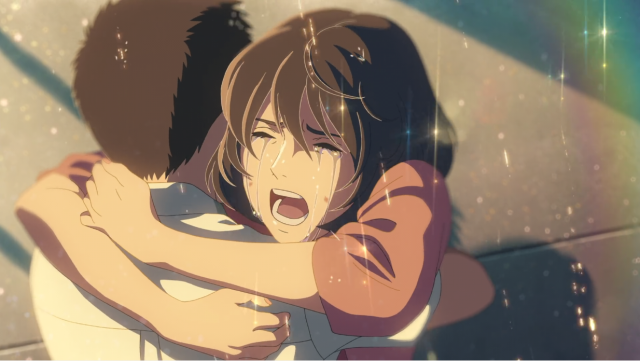 All in all this story is a little precious and predictable at points, but it still feels genuine in its portrayal of two damaged, awkward and isolated souls trying to find something to keep them focused. I appreciate that there is no feel good ending to this story, that they each move on to fulfill the roles they must despite their relationship. I appreciate too that this doesn't feel inappropriate to me, despite their differences in age and their situation. Normally I get pretty nauseous at teacher-student relationships of any sort, but this is in no way a sexual relationship, nor is it necessarily a romantic one (despite what the characters themselves might think) this is about love, but the kind of love that moves us forward...a deep friendship, and sense of responsibility...the way our souls (yeah, yeah) are tied for a time to someone elses though we often don't know how: platonic, fraternal, parental...whatever it is.